This article introduces the features that are available in the Technical Preview for System Center Configuration Manager, version 1702. You can install this version to update and add new capabilities to your Configuration Manager technical preview site. Before installing this version of the technical preview, review the introductory topic, Technical Preview for System Center Configuration Manager, to become familiar with general requirements and limitations for using a technical preview, how to update between versions, and how to provide feedback about the features in a technical preview. This preview introduces new feedback options in the Configuration Manager console. The Feedback options lets you send feedback directly to the development team, by way of the Configuration Manager UserVoice feedback website. In the ribbon, at the far left of the Home tab of each node. When you right-click on any object in the console. Choosing Feedback opens your browser to the Configuration Manager UserVoice feedback website, at https://configurationmanager.uservoice.com/forums/300492-ideas. The following are introduced with this preview. The next time your infrastructure qualifies for two or more updates, only the latest update is downloaded. For example, if your current site version is two or more older than the most recent version that is available, only that most recent update version is downloaded automatically. You have the option to download and install the other available updates, even when they are not the most current version. However, you will receive a warning that the update has been replaced by a newer one. To download an update that is Available to Download, select the update in the console and then click Download. We added an automatic clean-up function that deletes the unneeded downloads from the ‘EasySetupPayload’ folder on your site server. You can configure these settings using the client agent config class for the peer source feature (SMS_WinPEPeerCacheConfig) when you use the System Center Configuration Manager SDK. When the computer rejects a request for the content, the requesting computer will continue to seek content form alternate sources in its pool of available content source locations. With this technical preview version you can manage devices that are joined to an Azure Active Directory (AD) Domain Services managed domain. You can also discover devices, users, and groups in that domain with various Configuration Manager Discovery methods. The technical preview site infrastructure, clients, and the Azure AD Domain Services domain must all run in Azure. Azure AD with Domain Services (DS). A Configuration Manager site that runs on an Azure VM that is joined to your Azure AD. Configuration Manager clients that run in the same Azure AD environment. To configure Azure AD Domain Service, see Get started with Azure AD Domain Services. For each method you use, edit the LDAP query to search the Azure AD OU structures instead of the containers that are typical to on-premises Active Directory. This requires you to direct the query to search your Active Directory in your Azure subscription. Azure AD does not have an OU that stores groups. Instead, use the same general structure as the System or User queries and configure the LDAP query to point to the OU that contains the groups you want to discover. Azure Active Directory Domain Services on azure.microsoft.com. Active Directory Domain Services Documentation on docs.microsoft.com. A new device compliance policy rule is available to help you block access to corporate resources that support conditional access, when users are using apps that are part of a non-compliant list of apps. The non-compliant list of apps can be defined by the admin when adding the new compliant rule Apps that cannot be installed. This rule requires the admin to enter the App Name, the App ID, and the App Publisher (optional) when adding an app to the non-compliant list. This setting only applies to iOS and Android devices. Additionally, this helps organizations to mitigate data leakage through unsecured apps, and prevent excessive data consumption through certain apps. Learn more how device compliance policies work. Learn more how to create device compliance policies. Scenario: Identify apps that might be causing data leakage by sending corporate data outside your company, or that are causing excessive data consumption, then create a conditional access device compliance policy that adds these apps into the non-compliant list of apps. This will block access to corporate resources that support conditional access until the user can remove the blocked app. Beginning with this preview version, Configuration Manager Endpoint Protection provides an alert if more than 20% (default) of managed clients are using an expired version of the antimalware client (i.e. Windows Defender or Endpoint Protection client). Ensure Endpoint Protection is enabled on all desktop and server clients using client settings policy. You can now view Antimalware Client Version and Endpoint Protection Deployment Status by going Assets and Compliance > Overview > Devices > All Desktops and Serve Clients. To check for an alert, view Alerts in the Monitoring workspace. If more than 20% of managed clients are running an expired version of antimalware software, the Antimalware client version is outdated alert is displayed. This alert doesn’t appear on the Monitoring > Overview tab. To update expired antimalware clients, enable software updates for antimalware clients. To configure the percentage at which the alert is generated, expand Monitoring > Alerts > All Alerts, double-click Antimalware clients out of date and modify the Raise alert if percentage of managed clients with an outdated version of the antimalware client is more than option. You can now configure a compliance policy update rule to include a Windows Update for Business assessment result as part of the conditional access evaluation. You must have Windows 10 Insider Preview Build 15019 or later to use compliance assessment for Windows Update for Business updates. To gather compliance assessment information for Windows Update for Business updates, use the following procedure to configure the client agent setting to explicitly allow Windows Update for Business to manage Windows 10 updates. In the Configuration Manager console, go to Administration > Client Settings. In the properties for the client settings, go to Software Updates, and select Yes for the Manage Windows 10 updates with Windows Update for Business setting. In the Configuration Manager console, go to Assets and Compliance > Compliance Settings > Compliance policies. Click Create Compliance Policy or select an existing compliance policy to modify. On the General page, provide a name and description, select Compliance rules for devices managed with the Configuration Manager client, set the non-compliance severity for reporting, and click Next. On the Supported Platforms page, select Windows 10, and then click Next. On the Rules page, click New...., and then for Condition choose Require Windows Update for Business compliance. The Value setting is automatically set to True. The new policy displays in the Compliance Policies node of the Assets and Compliance workspace. In the Configuration Manager console, go to Assets and Compliance > Compliance Settings, and then click Compliance Policies. In the Deploy Compliance Policy dialog box, click Browse to select the user collection to which to deploy the policy. Additionally, you can select options to generate alerts when the policy is not compliant, and also to configure the schedule by which this policy will be evaluated for compliance. After you create the compliance policy, you can monitor the compliance results in the Configuration Manager console. For details, see Monitor the compliance policy. Use the following procedure to set a task sequence as high-impact. Any task sequence that meets certain conditions is automatically defined as high-impact. For details, see Manage high-risk deployments. In the Configuration Manager console, go to Software Library > Operating Systems > Task Sequences. Select the task sequence to edit, and click Properties. On the User Notification tab, select This is a high-impact task sequence. On the User Notification tab, select Use custom text. 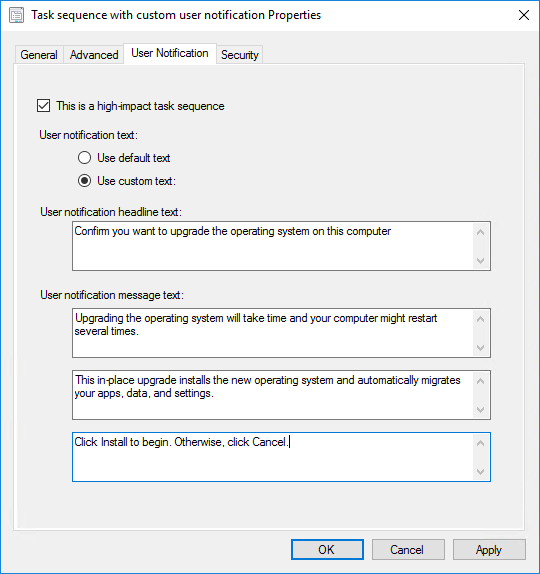 You can only set user notification text when the This is a high-impact task sequence is selected. User notification headline text: Specifies the blue text that displays on the Software Center user notification. For example, in the default user notification, this section contains something like "Confirm you want to upgrade the operating system on this computer". User notification message text: There are three text boxes that provide the body of the custom notification. 1st text box: Specifies the main body of text, typically containing instructions for the user. For example, in the default user notification, this section contains something like "Upgrading the operating system will take time and your computer might restart several times." 2nd text box: Specifies the bold text under the main body of text. For example, in the default user notification, this section contains something like "This in-place upgrade installs the new operating system and automatically migrates your apps, data, and settings." 3rd text box: Specifies the last line of text under the bold text. For example, in the default user notification, this section contains something like "Click Install to begin. Otherwise, click Cancel." Let's say you configure the following custom notification in properties. The following notification message will be displayed when the end-user opens the installation from Software Center. Use the following procedure to configure the details for the task sequence displayed in Software Center. These details are for information only. Restart required: Lets the user know whether a restart is required during the installation. Download size (MB): Specifies how many megabytes is displayed in Software Center for the task sequence. Estimated run time (minutes): Specifies the estimated run time in minutes that's displayed in Software Center for the task sequence. In the Properties dialog box of a deployment type, on the Install Behavior tab, you can now specify one of more executable files that, if running, will block the installation of the deployment type. The user must close the running executable file (or it can be closed automatically for deployments with a purpose of required) before the deployment type can be installed. In the properties of a Configuration Manager deployment type, choose the Install Behavior tab. Choose Add to add one or more executable file names you want to check for. You can also add a display name to make it easier for users to identify applications in the list. If the deployment will have a purpose of required, in the deploy software wizard, you can optionally choose to Automatically close any running executables you specified on the install behavior tab of the deployment type properties dialog box. If the application was deployed as Available, and an end user tries to install an application, they will be prompted to close any running executables you specified before they can proceed with the installation. If the application was deployed as Required, and the option Automatically close any running executables you specified on the install behavior tab of the deployment type properties dialog box is selected, they will see a dialog box which informs them that executables you specified will be automatically closed when the application installation deadline is reached. You can schedule these dialogs in Client Settings > Computer Agent. If you don’t want the end user to see these messages, select Hide in Software Center and all notifications on the User Experience tab of the deployment’s properties. If the application was deployed as Required and the option Automatically close any running executables you specified on the install behavior tab of the deployment type properties dialog box is not selected, then the installation of the app will fail if one or more of the specified applications are running. You can now create a PFX certificate profile that supports S/MIME and deploy it to users. This certificate can then be used for S/MIME encryption and decryption across devices that the user has enrolled. Additionally, you can now specify multiple certification authorities (CAs) on multiple Certificate Registration Point site system roles and then assign which CAs process requests as part of the certificate profile. For iOS devices, you can associate a PFX certificate profile to an email profile and enable S/MIME encryption. This then enables S/MIME in the native email client on iOS and associates the correct S/MIME encryption certificate to it. For more information about certificates in Configuration Manager, see Introduction to certificate profiles in System Center Configuration Manager. We've added new settings you can use in your configuration items for iOS devices. These are settings that previously existed in Microsoft Intune in a standalone configuration, and are now available when you use Intune with Configuration Manager. If you need help with any of these settings, see iOS policy settings in Microsoft Intune.